At it’s September Board meeting, Metrolinx received a report on a strategy for tracking the benefits of their regional plan, The Big Move. At the time, this and other business was overtaken by their slavish support for Transportation Minister Murray’s alternative to the Scarborough Subway. Now that the panel reviewing the Transit Investment Strategy has begun its public meetings and will soon report with recommendations on how we will all pay for The Big Move, a look at the measurement tools is in order. Regular readers here will know that I deeply distrust “Key Performance Indicators” from my own days in public sector management. They can be an exercise in so compressing information to a single-dimensional value that meaningful oversight is impossible. Even worse, they may be constructed to validate what management is already doing in an uncritical way. I have approached the new Big Move KPIs with the same skeptical outlook. The Baseline Monitoring Report and its appendices are linked from the main Big Move page on the Metrolinx site (not to be confused with the Big Move’s own website). 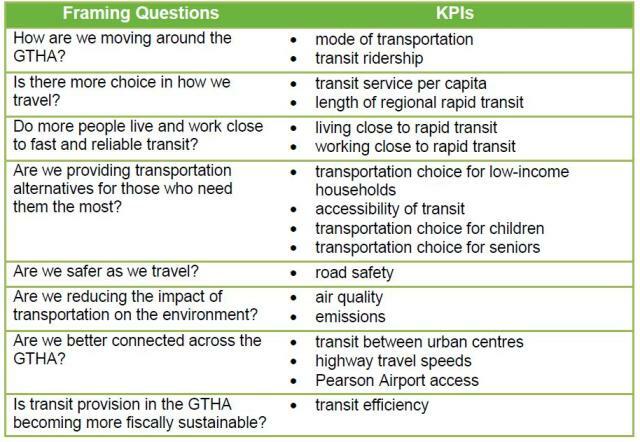 By looking at the proposed KPIs, we can learn what Metrolinx considers to be a mark of “success” and, conversely, what they don’t bother to measure. The Full Report gives an overview of the scheme and how it was developed, but the details of the KPIs are found in Appendix A: Monitoring Handbook. The report notes that circumstances have changed since The Big Move was first published with shifting demographics, population growth, and economic effects that alter how people make choices (if options are available) about travel. This provides a context for the current set of KPIs, although there is no discussion of how sensitive these might be to major shifts in the economic and transportation context. What follows are many pages listing all of the projects in various stages of planning, execution and completion throughout the GTHA. What is absent, however, is any quantification of the contribution each of these has made to achieving the overall goals (or will contribute when long-promised projects actually start providing service rather than photo-ops). While all this has been going on, the progress, as measured by some of the KPIs, of actually improving transportation has been less than stellar. A major challenge to any planner, operator or politician is that our environment is not static. Every year, the regional population grows by about 100K, and much of that growth occurs in areas poorly served by transit. Moreover, the travel demands from this growing population are many-to-many and do not lie conveniently along a handful of corridors where a few strategic upgrades could solve all of our problems. If the population were static, we could talk about new lines providing real benefits. However, when the population grows by 1-million in the decade needed to deliver major transit projects, any benefits are swamped in the losses to inaction in those parts of the region where no transit upgrades worth mentioning have occurred. The past decade’s history is a classic cycle — a boom leading to grand announcements (including The Big Move itself), a bust in which the dreams are shattered and most plans go into limbo, and a tentative recovery where announcements of a bright future collide with “we’ve heard it all before”. What did not stop was the population growth, and our collective timidity to invest in better transit has left the region ever more dependent, overall, on auto-based transportation. This is not the work of evil, car-loving maniacs bent on environmental destruction; it is the simple choice of millions of people for whom the car is the only viable option.